This breathtaking necklace was designed by renowned costume jeweler, Kenneth Jay Lane. The necklace has a very over the top look reminiscent of the necklace Audrey Hepburn wore in the opening scene of "Breakfast at Tiffany's". In fact, it was used on the cover of Harper's Bazaar when Natalie Portman wore Audrey's "little black dress". 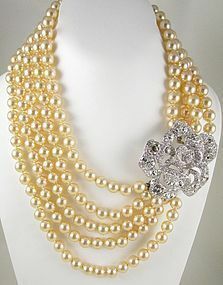 The necklace has 5 strands of 10mm glass pearls that end in an elaborate 2 1/2" diameter pave crystal rose. It has a wearable length of 18 1/2" and is approximately 2" wide across the strands of pearls. It is in excellent condition and is signed "KJL" on the clasp reverse.